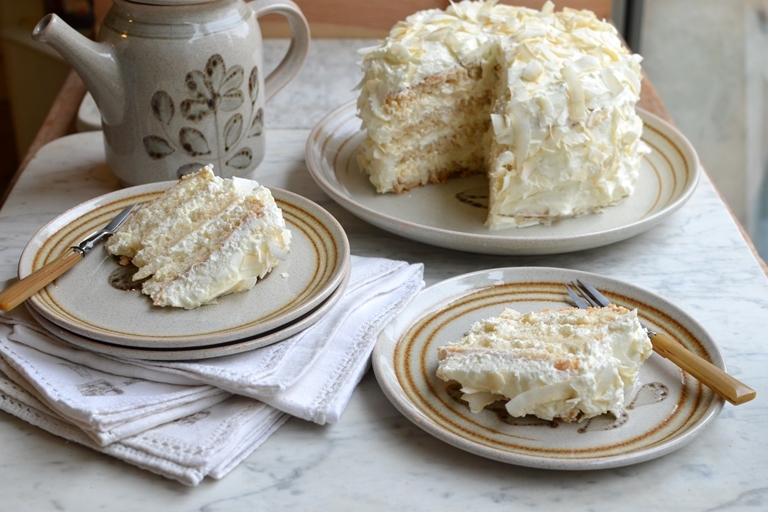 Karen Burns-Booth's spectacular coconut cake recipe is everything you'd want from a showstopping bake. Light, creamy and ethereal in its beauty, this cake would make a great centrepiece to any celebration. 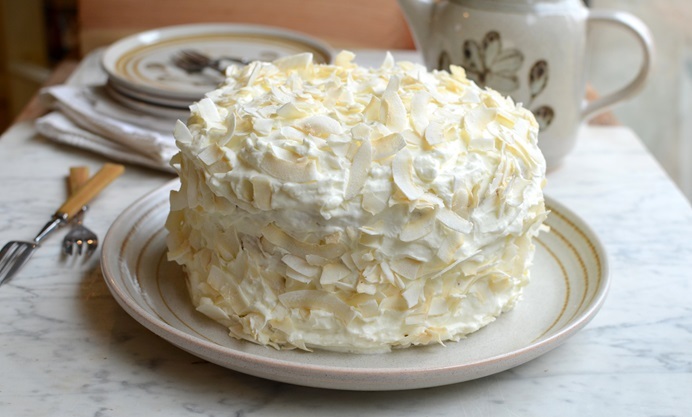 This is a beautiful big gateau-style cake that I remember with great fondness from when I lived in the USA; large and blousy, covered with cream and coconut, this cake is made with a classic angel food cake base, before being sandwiched together with whipped cream and coconut cream layers. This is just the type of cake that my American friends and neighbours would make for Easter, or any other spring celebration, as well as for Mother’s Day and birthdays. You need to get hold of coconut flakes or shredded coconut for the decoration; these are large dried pieces of coconut that are sometimes lightly toasted, and are very different to desiccated coconut that will not work with this cake. Make the cake the day before you plan to serve it, as once the whipped coconut cream is added, it needs to be kept in the fridge and as it is a very big cake, it’s best eaten on the same day, which is never a problem in my house! You can also freeze the basic angel food cake once made, it only takes a few hours to defrost and is then ready to add the coconut cream layers. It is essential when making an angel food cake that the cake tins are free of fat and there are no egg yolks in the egg whites. For this recipe, you need two deep 20cm ungreased cake tins, not loose-bottomed.